Israeli soldiers injured, on Saturday morning, a Palestinian farmer while working on his lands, east of the al-Maghazi refugee camp, in central Gaza. 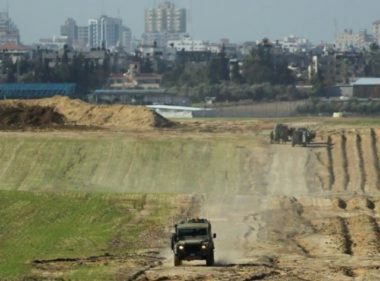 Eyewitnesses said the soldiers fired many live rounds at farmers in lands, close to the perimeter fence of the besieged Gaza Strip, to force them out. The added that one Palestinian suffered a moderate injury, after the soldiers shot him with a live round in his leg, and was rushed to a local hospital. In related news, several army vehicles and bulldozers invaded Palestinian lands, east of Deir al-Balah, in central Gaza, and fired many live rounds to force the Palestinians away.